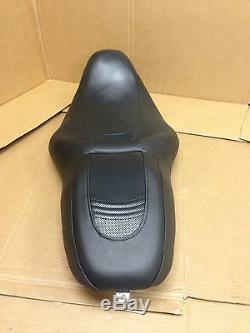 This will not fit any other style seat For the stock seat from 08-10 Streetglide , and the 2010 Road Glide. 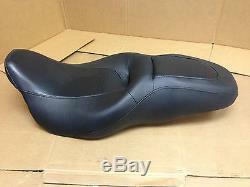 Harle y Seat part # 52320-09A Listing is for seat cover only, not the complete seat assembly. Flat rate pricing, your choice of colors. We even have exact matching dimple top vinyl for the center piece inserts. You choose what vinyl you want where. 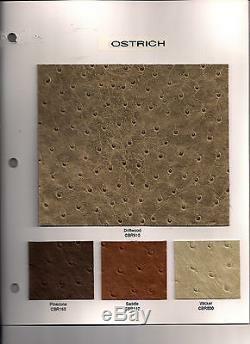 If you do not see a color or vinyl pattern you need, please contact me to see if it is available. You can mi x it up how you want. Solid one color, two tone, etc. When ordering, at checkout there is a checkbox "note to se ller" that will expand to open a box. E nter text of color choices you want where. Seat in pic ture has one of our replacement seat covers with the dimple top material and sewn in pleat s for th at OEM replac ement loo k. You can build the cover how you want. 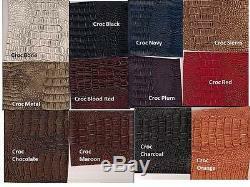 Stock, croc print, other color choices, etc. Our process is the same as our sno wmobile seat co vers. Flat rate pricing, your choice. We are the #1 build er of custom afterm a rket snowmo bile seat covers, now offering custom rep lacement seat covers for Motorcycles. D ealers welcome, please contact me to for dealer pricing. All you need is a screwd river, pliers and a staple gun. You can have a n up holstery shop near you install it if you are not comfortable doing it yourself , although it is really easy. More color options and vinyl choices to come. We will be adding many more model seats/bikes custom covers soon. We a re always adding to our pattern list. Please notify us within 14 days of receipt to request a return. 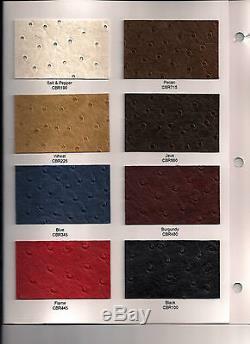 If you are uncertain about colors, please ask for free samples. We will be more than happy to send you some. Please do not ask our opinion of what colors will go with your bike. That is subjective and everyone sees colors in a different way. If we see an order that with our experience may look obtuse, we may offer you an option to think about, but we will not be held liable if you choose that option and are not happy with it. Seat covers all in one of the emotional colors can look obtuse. Two-tone is usually the best way to go. Seat covers should accent and flow with the bike. It should not be the focal point. This is an important key about art. Sometimes just a subtle dash of color pulls the whole thing together. Sometimes all it needs is a colored top stitch. 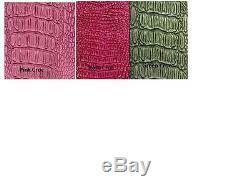 Top stitch colors are very basic and limited on choices. If ever in doubt, go with black, it goes with everything. Some colors will look different at every angle due to light refraction. We also make no guarantee that the digital representation of colors shown will be the same on every digital display device and or as you may see in different forms of natural light. Digital cameras and scanners reflect/absorb light to display in different ways that may not be seen in your retina under natural light. Also keep in mind adjacent colors can change the view of colors. Darker colors will darken, lighter colors will lighten. Three main rules on colors: Match, Complimentary match, and complimentary contrast. Example: Red and Brown are complimentary match. Blue and yellow are complimentary contrast. Cop yright 2013 Scotty's Sled Shed LLC. All patterns, ideas, and intellectual property are the sole prop erty of Scotty's Sled Shed, LLC. Duplication of any property is st rict ly prohibited. Scotty's Sled Shed LLC is not affiliated with Harley Davidson. 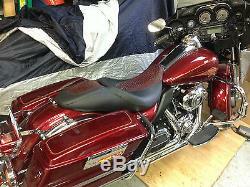 The item "2008-10 Harley Davidson Street Glide replacement seat cover custom colors avail" is in sale since Wednesday, February 13, 2013. 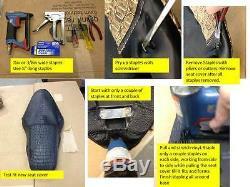 This item is in the category "eBay Motors\Parts & Accessories\Motorcycle Parts\Seats & Seat Parts\Seat Covers". The seller is "scottysledshed" and is located in Muskegon, Michigan. This item can be shipped worldwide.